promotion – get it today! DMC Champion Fong Fong performs with djay 2 and Reloop Mixtour DJ Controller. We are excited to announce our collaboration with Reloop on the Mixon 4, the first professional four deck DJ Controller for iPad. The Mixon 4 now works seamlessly with our entire product line on Mac, iOS and Android. Watch an in depth review video below. Learn more about the Reloop Mixon 4 DJ controller and other controllers on our DJ Gear page. Watch our CEO Karim Morsy demo djay Pro on the new MacBook Pro with Touch Bar during Apple’s keynote. DJ Sara performs with djay Pro DJ Software and Reloop Beatpad 2 DJ Controller. 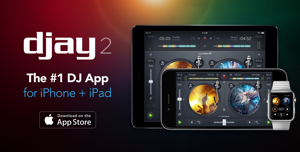 djay Pro is available on the Mac App Store for $49.99.